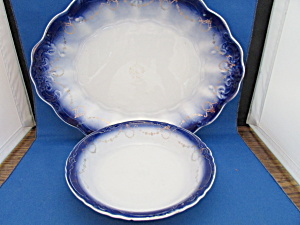 This flow blue platter and bowl was made in 1900 by La Francaise Porcelain. Very rare and collectible. Platter is 13" X 10" and bowl is 7 1/2". The platter has a design in the middle that is weak and the bowl the design barely there. Both pieces have crazing due to the age otherwise both items are in excellent condition.